This color changing effect is cool. Maybe I will post every blog in a different color and font! Well in the aftermath of the Yankees elimination from the post season, at least we can celebrate Mariano Rivera's DHL Delivery Man of the Award. This award is given out to the best reliever in baseball. Check out his credentials . It states he had 43 saves and a 1.78 ERA over the season. I would agree that this season he was the Delivery Man of the Year, and he did not blow an important game as he did in last year's ALDS. (Yes I am still bitter about that). No, I believe it was partly defense, but mostly an offensive problem this year that kept the Yankees out of post-season play. While I am on the topic of offense, I have to mention Alex Rodriguez's numbers in the regular season. He lead the team in almost every category: RBI (130), Home runs (48) and average with . 321. Now with team leading offensive numbers, wouldn't you think that he would be stellar in the post-season? Nope, he played average at best, and had nowhere near those numbers. The season in general was up and down. For the Carl Pavano and Kevin Brown (who were disappointments to the Yanks), Aaron Small and Sean Chacon stepped up their play. Tony Womack was another disappointment, but Robinson Cano played very well throughout the season, especially for being a rookie. 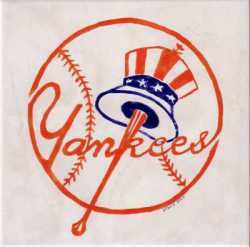 The Yanks were acutally second in the American League for runs scored with 885. But throughout the year, they were up and down, playing in between first place of the division and third place. There are many changes that will probably be made in the off season, which will be the focus of my future posts. I will end this post with a quote from Mike Mussina, one of the Yankees pitchers who received the lost in their last game of the season. It sums up their season pretty well, "We found contributions from people we didn't expect to get contributions from, and guys came through for us," the pitcher added. "It's hard to get to the postseason, but we've been doing it every year. When we get to October, we like our chances. We just didn't play well enough." ( According to www.yankees.com) I agree with you Moose. I like how you ended your blog with pitcher Mike Mussina’s quote and I agree with both of you as well. Also, I am celebrating Mariano Rivera's DHL Delivery Man of the Year Award~ he deserves it. I can’t believe he received 33 percent of the overall votes; that’s a huge percentage! It is awesome that DHL will donate $5000 in Rivera’s name to a local chapter of the Boys and Girls Club of America. Since I have been reading your Yankee blogs, I feel I am becoming more aware of Yankee stats and baseball stats in general, and I am not so intimated by them anymore. And by the way, I like the color changes! I am pleased to hear the Mo got the award for delivery man of the year. It was well deserved. He pulled the Yankees out of some sticky situations and should defiantly be commended for it. It’s sad to see Mel Stottlemeyre go. It’s been eleven seasons with Mel as the Yankees pitching coach. I don’t think that he really retired, Steinbrenner definitely had something to do with that. Mel just wasn’t getting the job done this year, he didn’t prepare his pitchers enough. He might be one of the reasons why pitching was a weak spot for this years Yankees. As you know, I am not a fan of the Yankees, however I am a fan of baseball and I totally agree that Mariano Rivera deserved the DHL Delivery Man Award. He is undoubtedly, hands-down the best closer in baseball and I don't see how this award could go to anyone but him. As far as A-Rod goes, no one saw that post season performance coming. After leading the club in almost all offensive categories and playing an MVP type regular season, how did he struggle that much in the post season? I think NY's problem this season was inconsistency. You have to have veteran's like Jeter, A-Rod, and Randy Johnson put up their usual numbers and stay consistent throughout the whole season; post season included. Even though the season is over for the Yankees, I do look forward to reading your future posts and seeing what you think will happen in the off season. Great news to hear about Mariano Rivera winning the DHL Delivery Man Award, I definitely agree that he is the best reliever in baseball. He has come through, more times then not. And because he is seen as almost invincible, when he does let up runs people get very angry at him. Yet few can even come close to his accomplishments to the team. I agree that AROD's performance in the post season was not what we expected from his performance in the regular season. However, I do not think we can take anything away from the great job he did for the Yankees over the course of the season. Players have slumps and thats just the nature of the game. I was very disappointed to see how poorly Carl Pavano did this season. When the Yankees first acquired him last year I was excited because I have seen how great he was on the Florida Marlins. His perfomance for the Yankees was terrible and I was almost relieved to see that he was on the DL for so long so that he would not screw up any more as the Yankees starting pitcher. I think that Moose pretty much sumed it up. Call Yankees and their fans greedy but we have come to expect to be playing in the postseason. I guess it takes a quote like that, after a tough loss to realize that just getting there can be a struggle. We should be happy that we have had so many good seasons, and even happier to know that our management will do all they can to ensure that we are back again next year. I think that Rivera was definitely the most deserving reliever this season, as he pitched lights out. He shook off any lingering effects of a struggle against Boston and pitched absolutely incredible. I hope that he is able to keep it up for a few more years. He is one of the best of all time. I also like the fact the DHL will be donating money to a good cause regarding the award.